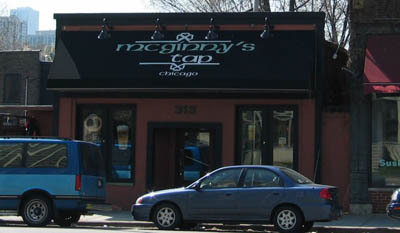 MC GINNY'S TAP is a fun little bar where you will enjoy spending hours with your friends, throwing back great drinks and enjoying the bar fare that we all love so much. We really enjoy the flat screen televisions that flank the walls, always displaying the biggest games of the day. The food isn't anything mind blowing here, just the usual pub grub, but that's not a bad thing! You can't beat the prices here, with three buck drafts and twenty five cent wings! You'll recognize it by that familiar awning outside. Can't miss it.